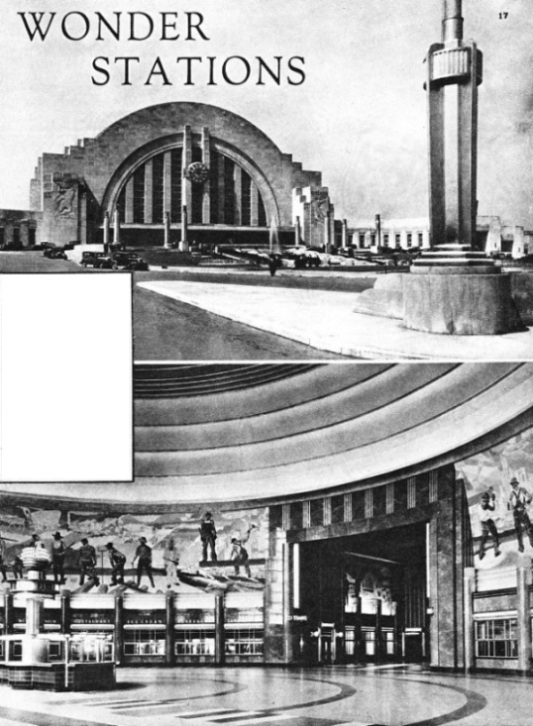 MODERN ARCHITECTURE is seen at its best in these pictures of the Cincinnati Union Railway Terminus at Cincinnati, USA. The mighty arch of the exterior is admirably set off by the terraces with their tall columns and the fountains playing in the foreground. The magnificent entrance hall with its range of shops and splendid mural frescoes depicting railway development is shown below right. This great station is used by all the railroads which serve the city of Cincinnati. 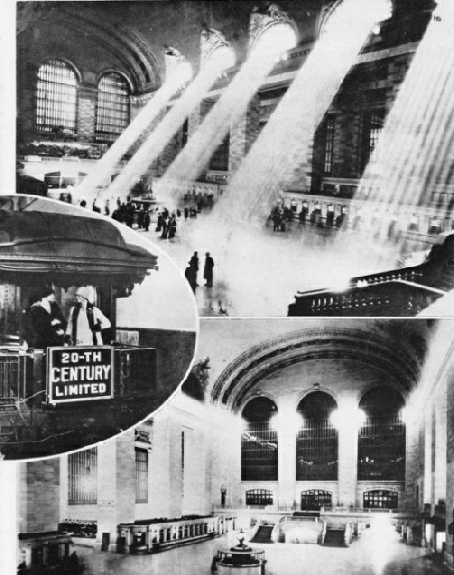 CATHEDRAL-LIKE is the interior of the Grand Central Station, New York, five views of which are shown above. The two views at the top were taken by day, and their animated appearance is a striking contrast with that shown in the pictures below, which reveal the upper and lower booking halls, deserted, at night. The railway tracks are underneath the streets. Trains enter or leave the station on two levels; the lower has 39 tracks accommodating suburban trains; the upper 41 tracks. These are used by the long-distance expresses such as the Twentieth Century (seen in the centre) which runs from New York to Chicago, a distance of 961 miles in 17¾ hours. 567 FEET IN HEIGHT, the mammoth New York Central Building houses the Administration Offices of the New York Central Railroad. 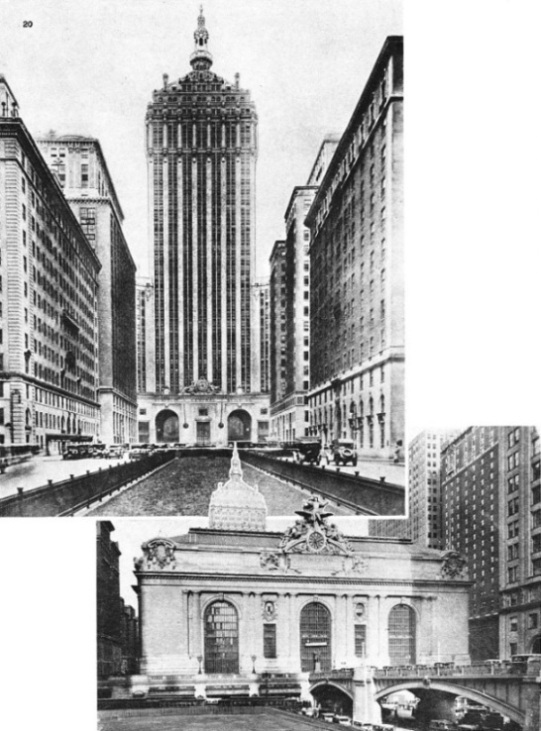 This mighty structure, straddling Park Avenue, lies to the rear of the Grand Central Terminus, and traffic goes directly through the building. The trains, all electrically hauled, run beneath the railed-in lawns shown in the foreground. This skyscraper, though not the highest, is one of the most imposing in New York, and comprises 34 stories, dwarfing the great buildings to its right and left. GRAND CENTRAL TERMINUS, New York City, as it appears from Forty-Second Street. The top of the New York Central Building is shown above the station roof. More than 700 trains enter or leave the terminus daily. 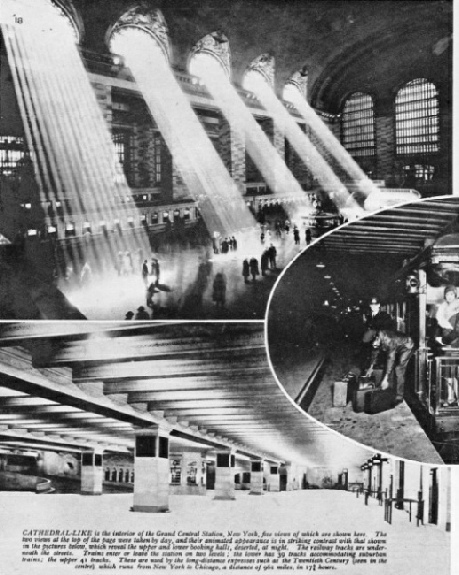 You can read more on “Germany’s Wonder Stations”, “The Modern Railway Terminus”, “North American Railroads” and “Railway Architecture” on this website.